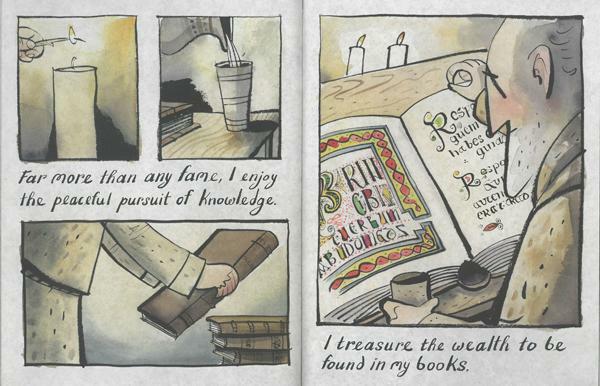 Summary: While a monk seeks knowledge among his manuscripts, his white cat, Pangur, seeks something a little more substantial; namely, a tasty mouse. 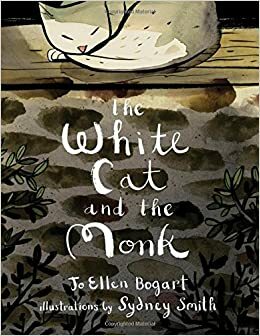 The first several pages are wordless, following Pangur as he explores the monastery, finally arriving at his master’s door and sticking a paw under to alert the monk to his presence. The monk then narrates their activities, concluding with a happy ending in which the cat snares his prey and the monk finds an answer to his puzzle. The author’s note at the end explains more about the poem “Pangur Ban”, written by a ninth-century Irish monk, on which this book is based. 32 pages; grades K-3. Pros: A poem by a ninth-century Benedictine monk seems like an unlikely source for a children’s book, but somehow this works, due in large part to the beautiful illustrations that perfectly enlarge upon the simple text. Cat lovers will be captivated by Pangur and his antics. Cons: Probably better for one-on-one sharing than reading to a larger group. I LOVED these illustrations so much! I’m also a fan of Sidewalk Flowers!